Having got a worldwide recognition with the 3d album "Non-Existence" Russian manic-depressive band Psilocybe Larvae is now extremely proud to present its new masterpiece. The 4th album entitled "The Labyrinth Of Penumbra" was released on Buil2Kill Records/Nadir Music on November, 5th worldwide. The album is also available on I-Tunes and more than 400 other digital stores from November, 1th. The recording and mixing process for The Labyrinth Of Penumbra took place at studio Kontakt under the guidance of Yury Smirnov, mastering duties were handled by Mats Lindfors at Cutting Room, cover art was created by A-Ra Design and the leaflet design by W. Smerdulak. The album was produced and mixed by The Eternal's Mark Kelson, with a slated release date of December 7th, and is set to garner the interest of fans of Swallow The Sun, Daylight Dies and November's Doom. Latest Album “CHASE THE DEMON” 10 Tracks of original Rock & Metal featuring ROY STONE on Lead Vocal & Lead Guitar. 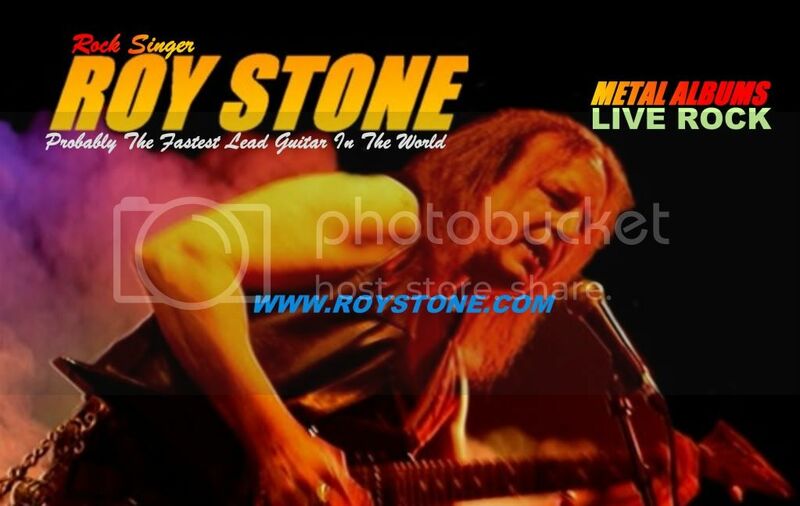 Up to an hour & a half of live material, ROY STONE is Lead Vocals & Lead Guitar live, advertised as “Probably The Fastest Lead Guitar In The World” which is for contention, strong melodic Rock & crunching Metal Tracks, normaly a guitar solo section is amongst the songs too…. Russian manic-depressive band PSILOCYBE LARVAE has completed the recording of their new album called “The Labyrinth Of Penumbra”. The recording and mixing process took place at studio Kontakt under the guidance of Yury Smirnov, mastering duties were handled by Mats Lindfors at Cutting Room and cover art created by A-Ra Design. Brudywr, a black-metal project from Irkutsk, Russia has recently published his new single "Coven" on jamendo.org. There’s as usual a dozen and a half minutes of old-school black metal. Everyone is invited to check it out by the following link: Brudywr "Coven"
In a letter sent to the evangelical community of their hometown Colorado Springs, Colorado, the band Dethcentrik stated "we despise your brainwashing so called 'Christian' ideals." The letter's most "threatening" tone was used in the phrase: "don't bother saying anything, we are awaiting to arise from our hate-based repression, when we deem appropriate." In a statement from the band, they said: "That simply meant that we will decide when to expose the truth. What they have to fear most is that their religion will be expose for what it is: fake and full of hate. Evangelicals already have enough control of this town to where people are allowed to be punished by government institutions for expressing religiously-based opinions, our vocalist was forced to leave his school once for wearing a t-shirt that was offensive to Christians and being told that Jesus loved him. That's not much of a separation of Church and state now is it?" Despite the band's intention with the statement, they landed on a community threat list entitled "Threat Awareness in Places of Worship," which can be found . Dethcentrik's latest release, Why the Innocent Die Young, is slated for release late this year. Edge Of Paradise rising Metal Mavens! Industrial Melodic Metal Band EDGE OF PARADISE Gear Up To Reek Havoc On The World With Forthcoming Debut Release MASK! The Los Angeles based female-fronted metal band, Edge Of Paradise, are ready to set the world aflame, with a worldwide digital sales premiere on Loudtrax of their debut CD, Mask. And world release of their music video for "Mask", wich premiered on AOL's Noisecreep! Check out the album here: http://www.loudtrax.com/Artist/EdgeOfParadise . Edge Of Paradise is fronted by the stunning Margarita Monet who delivers potent yet melodic vocals along with virtuoso keyboard playing that adds a unique classical flair to the band’s sonic metal assault. Combine that with the ferocious fretwork of guitarist Dave Bates who intertwines compelling leads and bombastic riffs and you’ve got a band that offers something highly refreshing in today’s modern metal sound-scape. Mask also features guest appearances by renowned session drummer Gregg Bissonette (David Lee Roth, Don Henley and major session drummer for hit-TV and movie soundtracks) and bassist extraordinaire Tony Franklin (The Firm, Glenn Hughes, Blue Murder, Roy Harper) who prove to be the ultimate rhythm section when it comes to the hard-edged rock sounds contained on the debut recordings. Other guests on the CD include bassist Bjorn Englen (Yngwie Malmsteen), drummer Craig Anderson and backing vocals from Robin McCauley (MSG) who also co-wrote most the songs along with Dave and Margarita, and cutting-edge songwriter Ryan Jones. Edge of Paradise was formed in the beginning of 2011 from the ashes of Dave Bates’ former band Bleed, which was fronted by Robin McAauley. The influences on the CD are incredibly diverse, and have been pegged as “Industrial Melodic Chaos”. Margarita states “it has always been my vision to create music that will be around for a while and I feel like we have really achieved that with Mask.” The band plans to tour the US at the start of the year 2012, to promote Mask. Along with Margarita and Dave, drummer Kevin Katich and bassist Steven Cook will round off the live band. Mask features 9 stellar tracks, highlighted by "Falling Down," "Tail Of The Gun," the title track "Mask," and modern-day power ballad "We Breath". Anachronaeon Uploads Cover Of Iron Maiden's "Wasting Love"
Hey guys... it's been a while since we've updated this site but now we actually have something. We are releasing a cover song as a free download... Iron Maiden's "Wasting Love". so don't expect a version true to the original. Smerdulak has begun working on the cover art for "The Ethereal Throne". We are so eager to see what he will come up with... it is said to be really dark. Hopefully the release plans of getting this album out in 2011 can be true. 4 tracks of doom death metal!!! you can hear a preview of single on our myspace!! !